The BLACK+DECKER BDEQS300 1/4-sheet orbital sander is ideal for finish sanding and detail work around the house. This sander runs at 1,600 orbits/minute with 2.0 Amps of power for efficient material removal. With a compact size and ergonomic design, this sander can get into tight spaces and maximizes user control. This sander features paddle switch activation for easy on/off during application. The paddle switch is located on top of the sander and is activated by pressing down naturally with the palm of the hand as if the sander is in use. This long-lasting, durable belt sander by Makita features a powerful 7.8 amp motor and replaceable graphite wear plate to reduce friction, and an extended base to allow flush sanding. Plus, easy lever controls allows for efficient belt changes. Standard equipment includes an abrasive belt, dust bag, cork rubber plate and graphite plate. 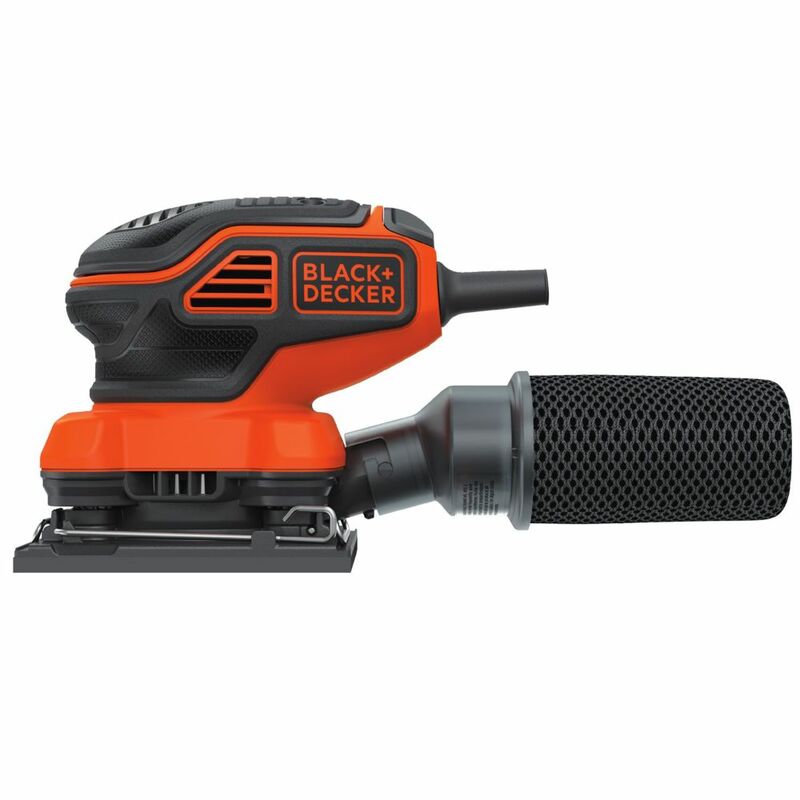 BDEQS300 1/4 Sheet Orbital Sander with Paddle Switch Actuation The BLACK+DECKER BDEQS300 1/4-sheet orbital sander is ideal for finish sanding and detail work around the house. This sander runs at 1,600 orbits/minute with 2.0 Amps of power for efficient material removal. With a compact size and ergonomic design, this sander can get into tight spaces and maximizes user control. This sander features paddle switch activation for easy on/off during application. The paddle switch is located on top of the sander and is activated by pressing down naturally with the palm of the hand as if the sander is in use. BDEQS300 1/4 Sheet Orbital Sander with Paddle Switch Actuation is rated 3.0 out of 5 by 2. Rated 5 out of 5 by The Refinisher from Great Tool! I have used this sander on several refinishing projects: 2 bookcases, a 2-drawer stereo stand, 4 night stands, an antique washstand, and a large oak dining table. The sander works great! I have used various sanding grits and prefer to cut my own sanding sheets (1/4 of a large sheet); I’ve use the included punch block to make the holes and have had no problems with fit or slippage.